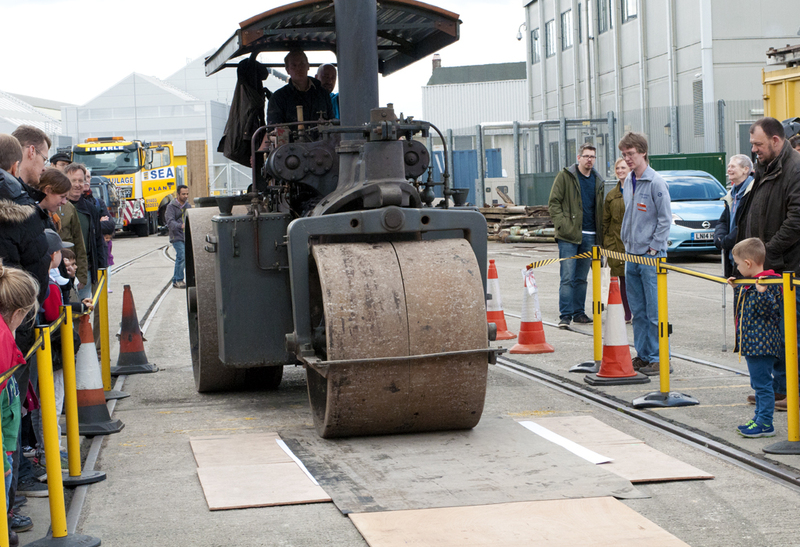 On Saturday we made our largest ever print using a steamroller! 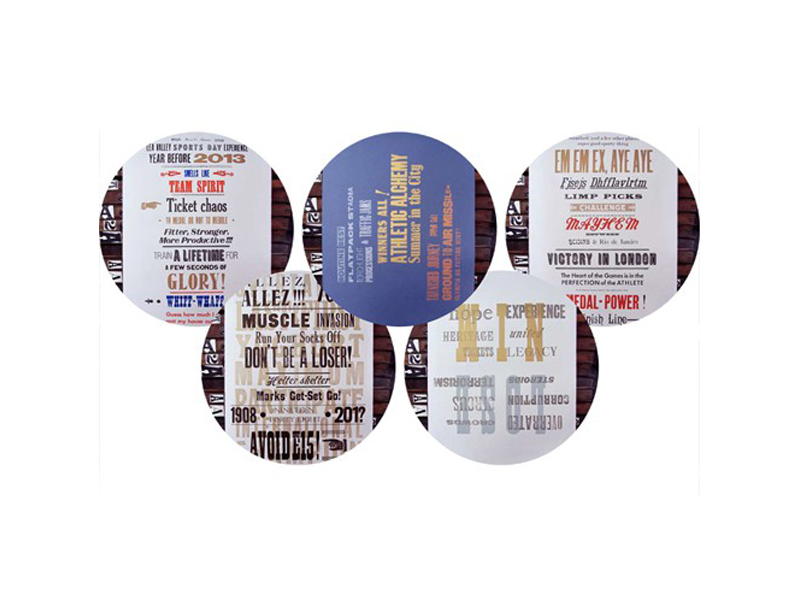 We were thrilled to be invited by Ditchling Museum of Art + Craft to take part in the second stage of their Big Steam Print event at the London Transport Museum depot, Acton. It was great to share the excitement for printing with everyone who came. 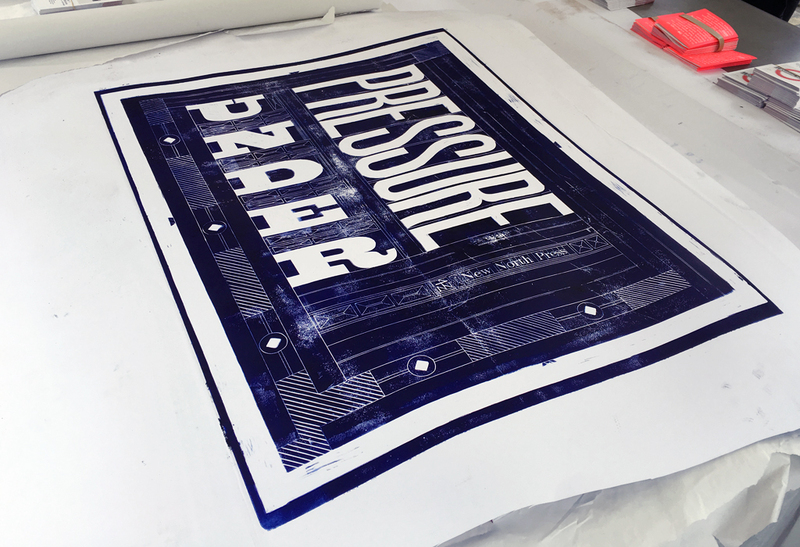 Our print – artwork based on a letterpress forme cut and into linoleum – will be exhibited with all the other steamroller-printed work at Phoenix Brighton from 6th – 21st August 2016. 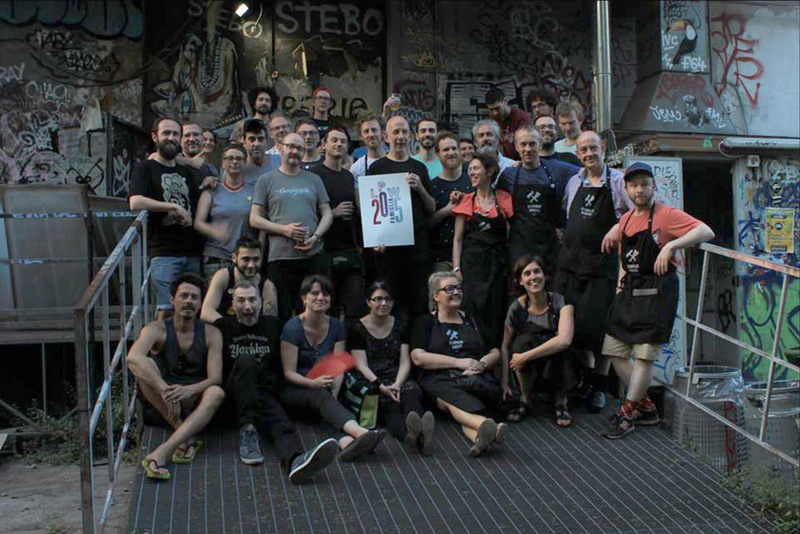 Such a pleasure to have been part of Letterpress Workers International Summit 2015 alongside a hugely talented and sweaty group. On a personal level it was also a treat to finally meet in person some of the artists we had made contact with back in 2010 for our Reverting to Type exhibition. Massive thanks to our excellent hosts Officina Tipografica Novepunti. 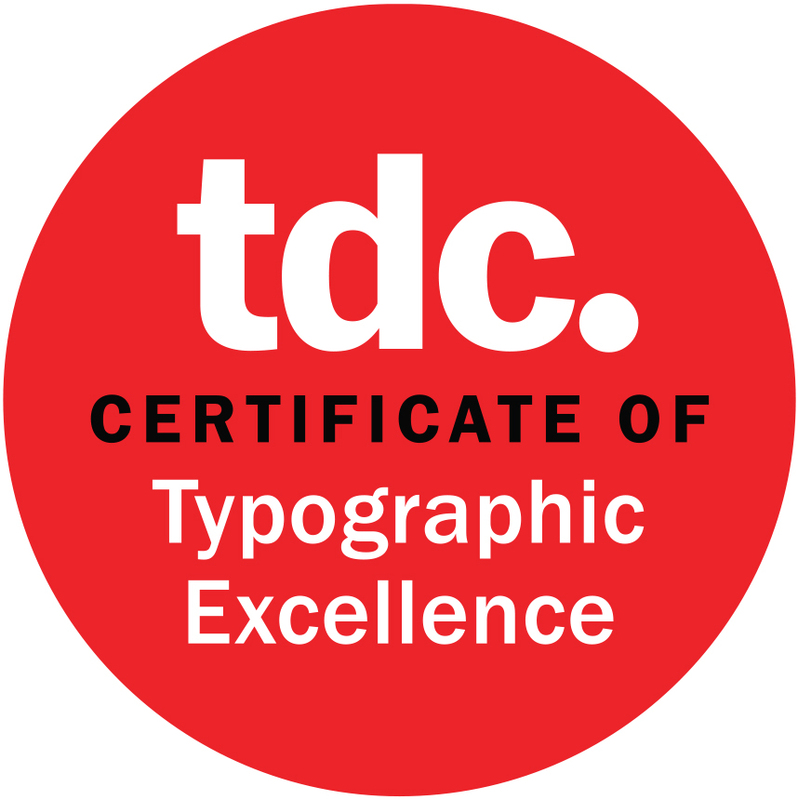 We’re thrilled to announce that A23D, our 3D-printed letterpress font, has won a prestigeous ‘Typeface Design Award’ from illustrious Type Directors Club, New York. Congratulations to A2-Type and thanks again to all involved, particularly the Arts Council England who made the project possible. We’re proud to announce A23D, our 3D-printed letterpress font which will be launched at the V&A as part of London Design Festival. 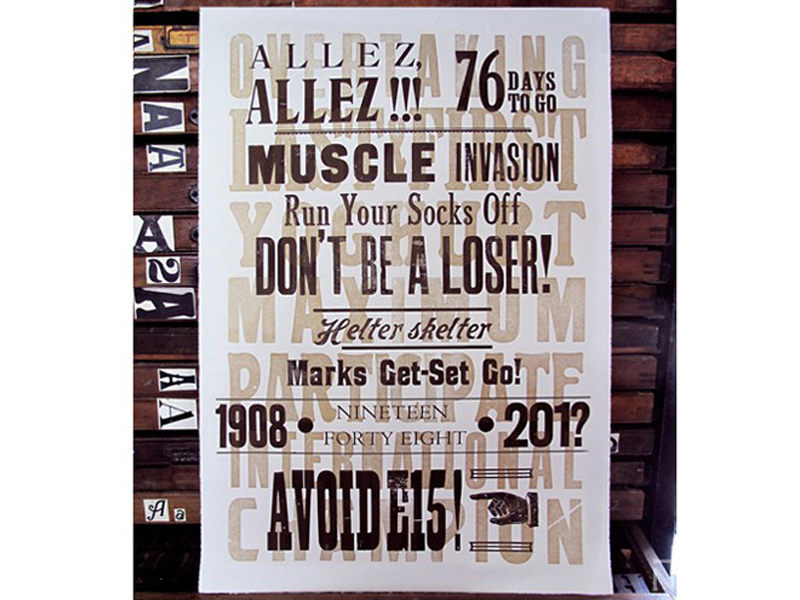 We will be giving talks and screening a film about the project, as well as a printing demonstration of the font in use. 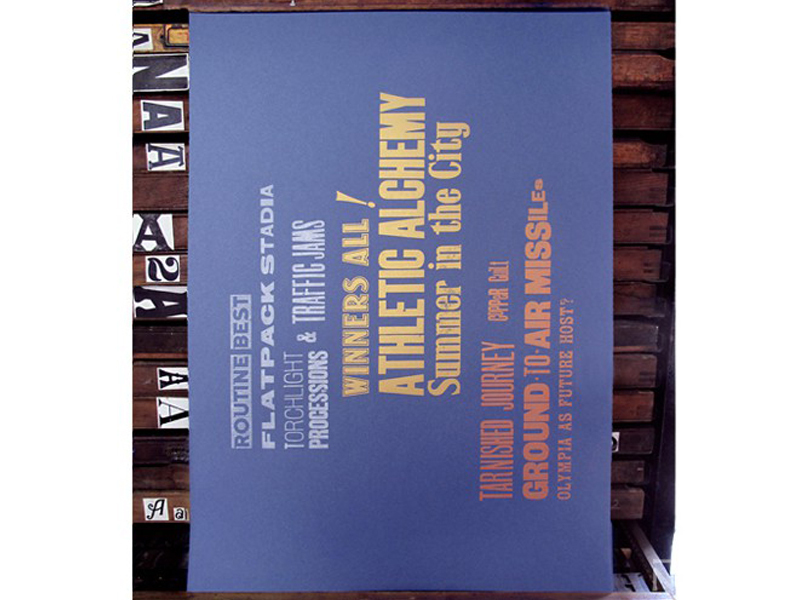 A23D has been designed by renowned type designers A2-Type and fabricated by specialist model makers Chalk Studios. Adrian Harrison’s fantastic short film charts the project’s course, from initial designs to the font’s first use in the limited edition A23D specimen posters. It was our great pleasure to be visited by Jim Sherraden of Hatch Show Print (who’s trip to the UK coincides with a fantastic exhibition of Hatch’s work at CHELSEA space). Having contributed prints to our Reverting to Type show but never visited New North Press before, Jim described the workshop as “the cat’s miaow”. This beautifully shot short film documents the recovery of a dormant hand-pull press. Filmmaker Tom Stokes joined us on our journey to LEFA Print where manager Ed Arthur had generously invited us to loan the press in order that it should have a second life. 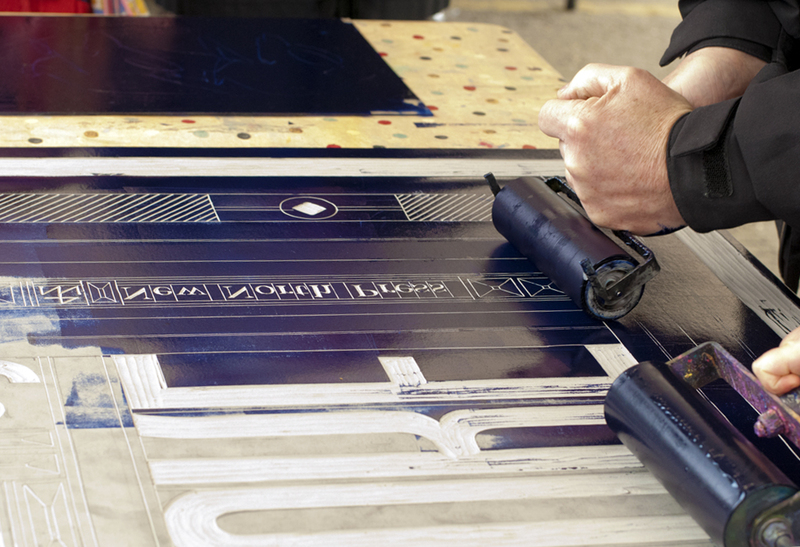 New North Press founder Graham has been an external letterpress tutor for first year BA Graphic Design Communication students at Chelsea College of Arts since 2002. 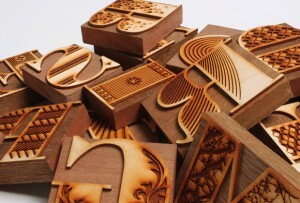 In a project initiated by course leader Nigel Bents, assisted by Paul Oakley and Jonny Holmes, the students designed ornamented letterforms, a selection of which were produced as a lasercut letterpress font. The letters were cut from 3mm plywood then mounted to blocks to make them type high. 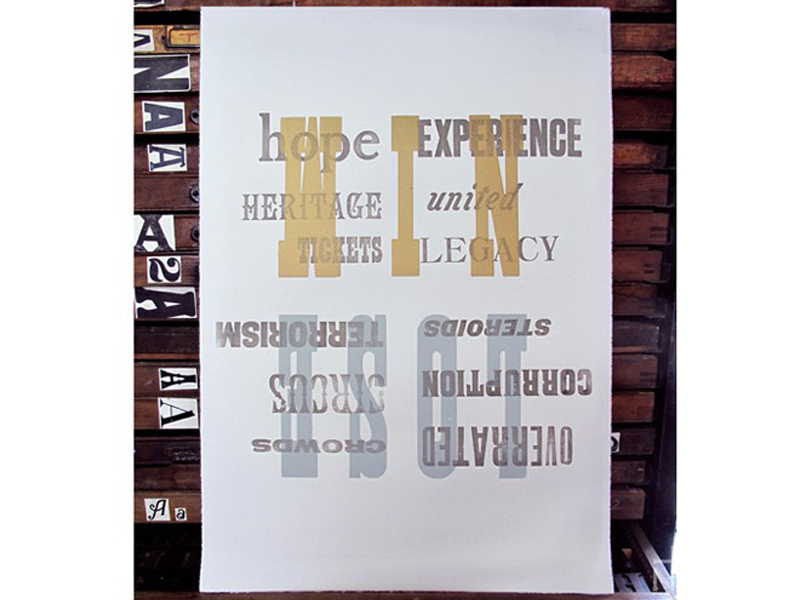 The finished font will live at New North Press as a new member of our type library. Taking inspiration from the Olympic Committee’s strict rules regarding the use of words relating to this summer’s Games, we have been setting the recent participants of our workshops an Elephant in the Room project to describe the indescribable. 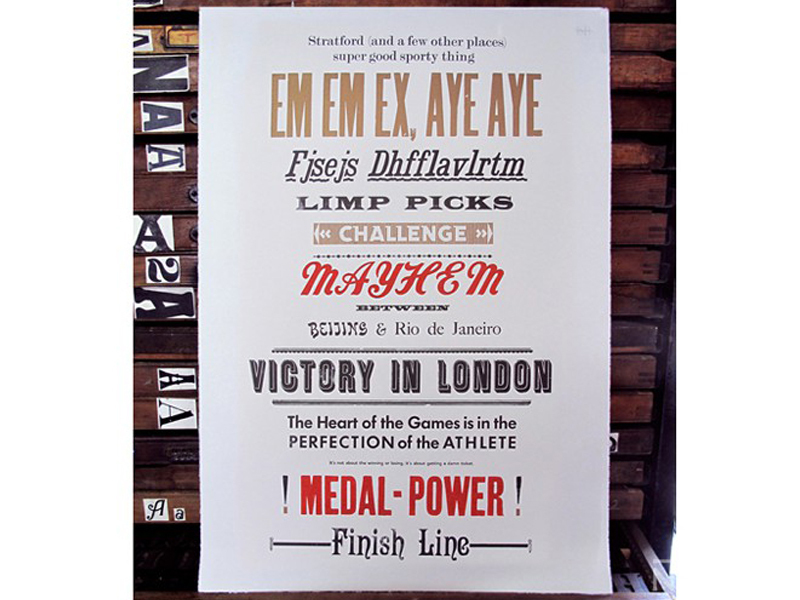 Olympic, Games, London, 2012, medals, summer, gold, silver and bronze – just some of the words banned from unauthorised public use in conjunction with London 2012 Olympic Games. But instead of causing headaches, these stringent rules have provided the inspiration for the project set at New North Press’ monthly Introduction to Letterpress classes. 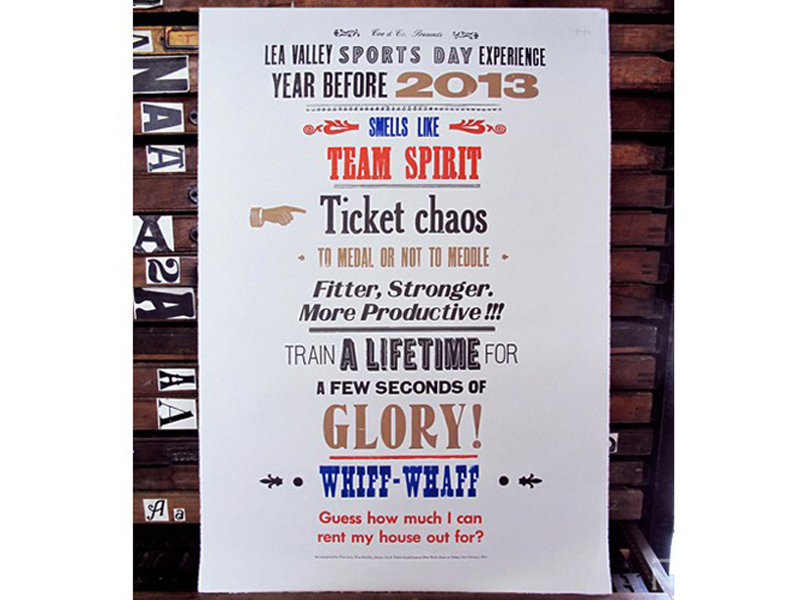 Below are five group’s outcomes exploring the theme, while strictly adhering to the Olympic Committee’s stipulations. Those who took part were from various walks of life and had an array of political and emotional opinions on the subject, which were discussed and incorporated into the final designs. 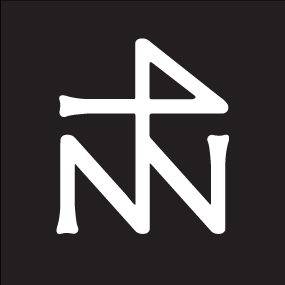 NB: These prints are the personal work of the participants involved and were not created to be sold or make any associat ion with business, goods or trade of any kind. Their purpose for being is solely to describe something which could not be mentioned in the public domain. We’ve been working with pupils from Holy Trinity Primary School in Dalston and performance poet Adisa on a project about the appreciation of libraries. 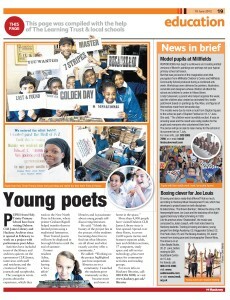 The pupils, who were 10 years old, showed amazing proficiency at type setting and were thrilled to see the words they had written published by their own hands. The prints will be displayed in libraries across Hackney until the end of the summer and the project was written about in Hackney Today.